I cannot be the only knitter to crave big needles and bulky yarn after so many finely knit sweaters. They were the tools I learned on and any time I pick them up again I feel nostalgic and soothed. So, after finishing and blocking the cardigan I'd been knitting on microscopic size 1 needles for the last month, my wrists and my mind needed a break. Lucky for me I received the Good Night, Day booklet in the mail the next day. This booklet is a collection of patterns from Tara-Lynn Morrison's collection that I've been eyeing for a while now. I like that she published it herself and handknits these patterns and more for her business. So, I broke my digital pattern commitment over it (I prefer pages anyway.) I immediately set aside whatever I was working on to knit up the Pembroke Tank while my husband watched Tortilla Soup with me. Chick flicks and bulky yarn... I'm telling you it's comfort food. This is where I need to say that these patterns don't require that much yarn and really deserve a high quality wool, maybe with a unique dye process, and especially in thick and thin variations. 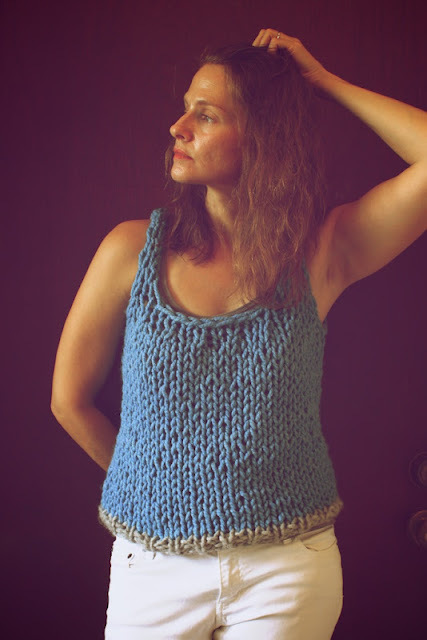 I can see getting just a couple of really great skeins on vacation and using them to work something like this tank. So keep this in mind as you see my cheap yarn version and know that I really do "get it" but just haven't gotten the right yarn yet because that requires ordering and there goes the spontaneity. I did pick up Lofty Wool at the craft store a few days ago, but it didn't take long for me to see that Lofty Wool is too lofty and stiff. I felt like the Michelin Man on his monthly cycle and that's not my very best look, so I placed an order for Araucania Liwen and pulled out some Thick and Quick from the garage stash just to play around with in the meantime. This could seriously be knit in an hour unless it is modified, which mine was out of necessity. I used size 19 circulars for the stockinette instead of 35 because I don't have circular 35s and was reveling in knitting loosely. 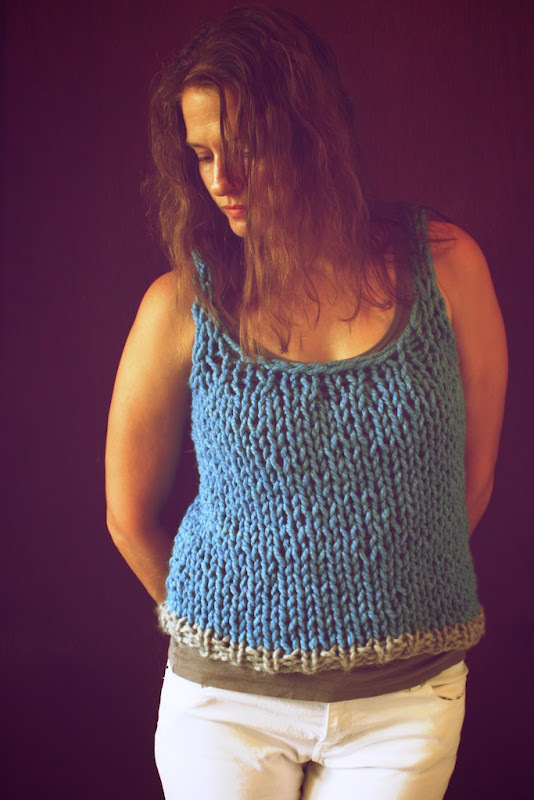 I also had to make only one skein work, so I made the ribbing a contrast color to ensure I had enough of the main color for the rest of the tank. I just used a small remnant of Bernat. Even with the additional color, I was still running short so I tried for less yarn joins and ends to weave in. After splitting the front and back to work separately, I made my decreases then put the left front stitches on a holder. I bound off the stitches for the front neck, as directed, then began working the front, right strap. 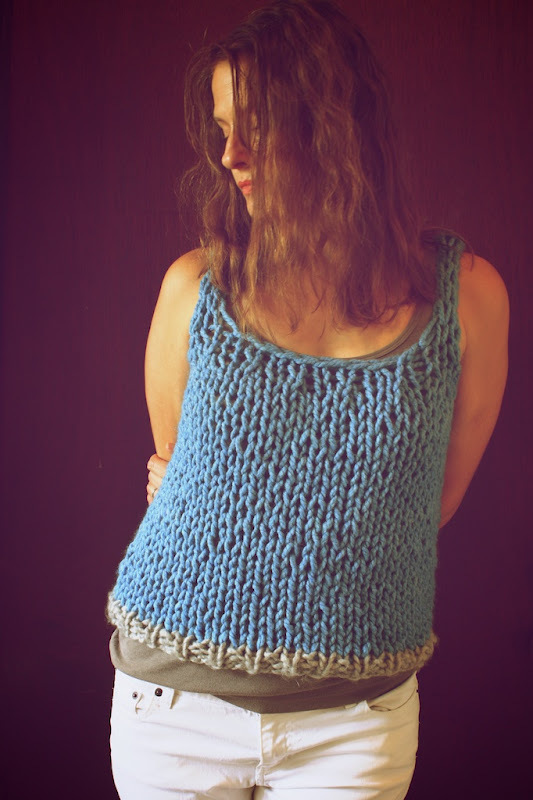 I knit it twice as long as normal to go over the shoulder and form the back, right strap too. When finished, I left those stitches live on a holder and moved on to work the back. After binding off for the back neckline, I worked the strap (or straps) for the left shoulder, making it twice as long then bringing it over the shoulder to join with the live stitches from the front left with Kitchener stitch. I then joined the right strap to the back of the body with Kitchener and that was it. Six ends for me to deal with rather than 9 and I had just enough yarn. Did that make any sense at all? I usually prefer kitchener, especially since it is such a small area to be joined. 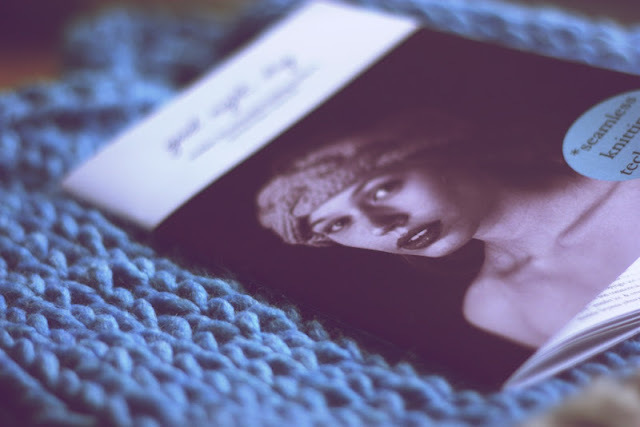 As I said, I'm not crazy about Thick and Quick yarn, but I went ahead and took photos and added it to my projects page because everyone has at least one skein of this stuff and maybe a skein or two of really great, bulky yarn but no ideas of what to knit with it. 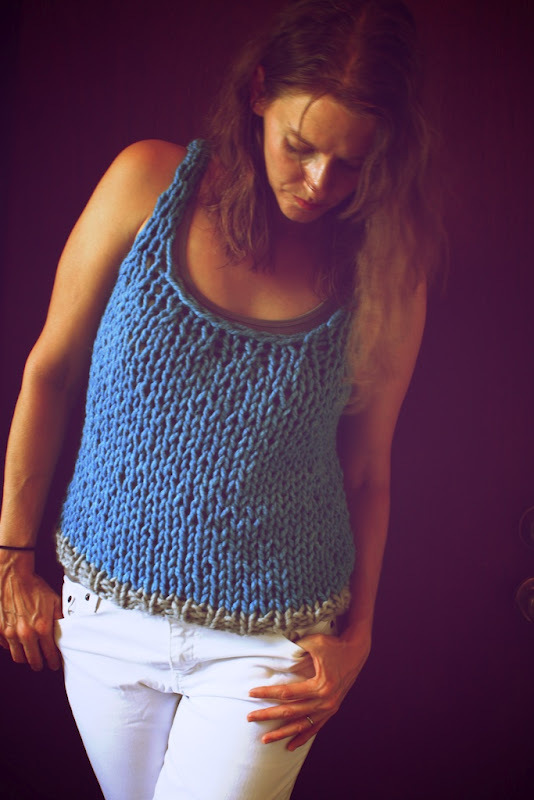 Knit this, people! My daughter walked past me, did a double take, and said, "Can you make me one?" But this is definitely something a beginner can do, so I'm going to convince her to do it herself.